If you need a fun mousepad for in the office then come check out this office robot mousepad. 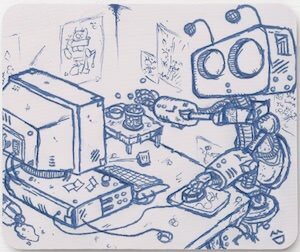 The mousepad almost looks like a piece of paper with a cool pen drawing on it and the drawing shows robot working the computer in the office and even using a mouse it self on a mousepad. The robot mousepad is 9.25 x 7.75 inches and has a nonslip back so that it really stays in place when you are using it for work or gaming. No more need to have a boring plain mousepad because you can own yourself this fun Office Robot Mousepad. If robots are your thing then this t-shirt is probably perfect for you. 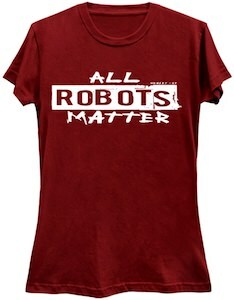 On the t-shirt, in a cool font with a banner in the middle, it says “All Robots Matter”. 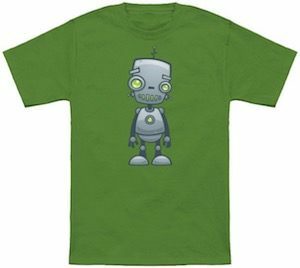 It’s a great t-shirt and it is available in styles for both men and women and comes in many cool colors and in sizes Small – 6XL so that many can enjoy wearing this robot t-shirt design in a look and size they want. Now you can show the world that robots really matter and that is what you want for sure. So come and get your own All Robots Matter T-Shirt. If you like robots and the beach then you want to get this robot beach towel. 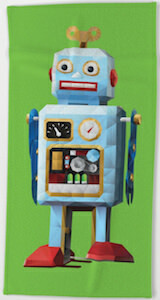 The beach towel has a nice green background and on it that you can find a big robot and the robot may not look like what you expect these days but it looks a lot like a classic robot we seen a lot in toys. And as this is a beach towel you want it to be nice and big and the robot towel is 74 x 37 inches and is available in a smaller bath towel too if you don’t want a huge robot towel. Time for the beach and pool is coming so come get your Robot Beach Towel. If you like LEGO and robots then you just need this Robo creator set. The Robo Explorer set is number 31062 and includes 205 pieces including a light brick. 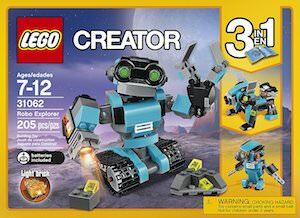 And as it is a creator set it includes building instructions for 3 different robots. First, you can build Robo Explorer that is a really cool robot with tracks so that it can explore faraway planets. And this robot is about 4 inches tall. And besides the main robot, you can also build a robot dog and a robot bird and that means you can enjoy many building sessions as you can keep changing the robots. Come get your LEGO Robot Explorer Set. If you like robots and need some fun leggings then you came to the right place as these black leggings are covered in heads of robots. The robot leggings are made from 92% polyester and 8% spandex so that they feel and look great and have a nice stretch. Sure these leggings may be a little bit nerdy but if that is what you are and are proud of it then wearing these leggings should be something you need to do. The black and robots really make for a nice combination and something that quickly can become one of your favorite pair of legwear. So get your robot on and order you Robot Face Leggings. This t-shirt is really romantic as the robot you find on this t-shirt shows its love for you. 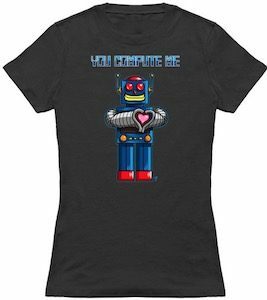 On the shirt, you can see a really happy looking robot and with its hands, it makes a heart to show its love and then above it you find the text “You Compute Me” which sounds a lot like you complete me only then in Robot style. You can get this romantic robot t-shirt in styles for both men and women and it is available in sizes Small – 6XL and it does come in many colors too. So if you want to show someone your love then maybe get them this special robot t-shirt. Now there is a robot t-shirt that would work for men and women and yes you can pick the color and even a size between small – 6xl. On the robot t-shirt, you can see a cartoon style robot and I can’t figure out if it looks happy or depressed but it still looks fun and a bit silly. Robots are fun and this robot could be seen as fun especially because it is a cartoon figure and not a big metal box or robot arm. So add a robot to your wardrobe by ordering this Funny And Silly Robot T-Shirt. If you like robots and Christmas then this Christmas tree ornament is something to look at. The ornament is star-shaped and has a gold thread to hang it with. The ceramic ornament is white and on that white, you can find many funny looking gray robots all wearing Santa hats and there is more as there are green and red presents and other Christmas details all over the ornament. 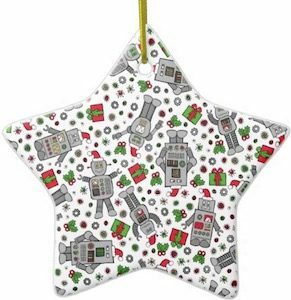 So if your Christmas tree needs some tech then why not start with a fun ornament with robots as robots are fun and the ornament will fit right in with the rest of the decorations. Come get your Robot Christmas Ornament. This power bank is made for people that like robots to start to look more like humans. 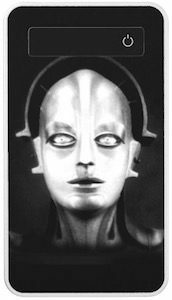 On the front of the power bank you can see a black background with on it the head of a humanoid robot and it’s starting right at you. Above the image your can see a little display that tells you a bit more about the battery status. The robot power bank offers 4000 mAh of power witch is enough to charge your phone on the go a couple of times and then when you get home you just charge it up again for the next day. And this power bank even has some cords included so that you can charge a bunch of popular devices right out of the box and if you device cable is not included then you can just choose to plug you own USB cable in and you are ready to go. Come have a closer look at this Humanoid Robot Power Bank. Now you can replace that boring old bathroom scale with something way more fun. 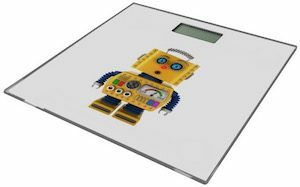 This is a robot scale that has a white background with on it a yellow toy robot that looks really surprised and yes of course that means that he thought you where way heavier then your really are. Above the robot you can find the LCD display that can show weight up to 397lbs and yes this bathroom scale can also show weight in KG’s. A cute bathroom scale like this is great for adults but even work for the kids bathroom as long as the kids weigh more then 13lbs as that is the minimum weight the scale need. Come check out this Surprise Looking Robot Bathroom Scale.